Chelsea vs. Steaua Bucharest : 11 December 2013. 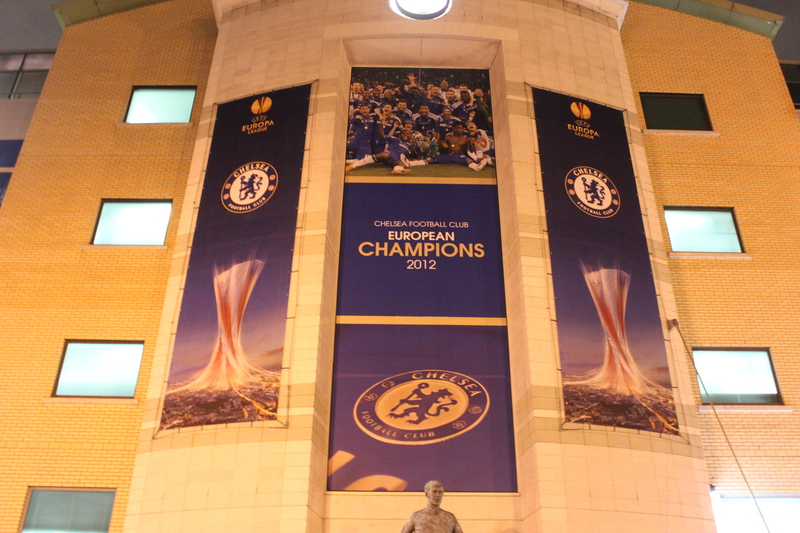 When the European Cup became the Champions League over twenty years ago, Chelsea Football Club looked on from afar. Until that point, European football was a rare treat. However, within the football fan community, there was immediate disdain of the participation within it of league runners-up. The “Champions League” suddenly became a misnomer. Then, the cut-throat knock-out nature of the old competition was thrown away in favour of a mini-league format. Football fans, showing considerable unity throughout the continent of Europe, were again dismayed. Most saw its formation as UEFA appeasing the fat cats at the top table, virtually guaranteeing them all top level competition on an annual basis and staving off threats of a breakaway pan-European league. Since those days, Chelsea’s participation within the competition has been a regular event. This would be our eleventh season in a row. For us supporters, the real advantage of the Champions League group phase, played under lights in various degrees of midweek darkness every autumn, has been to pick and choose which of the three away games we are able to attend. Very often, the home games – especially on match day five or six – offer little distraction. The Chelsea vs. Steaua Bucharest game, in itself our fourth match-up with the Romanians in nine months, was therefore hardly filling me with enthusiasm during the day. In fact, if truth be known, as the day progressed, I kept questioning myself as to why I was bothering to attend. Our passage into the last sixteen was already assured, there would be a tiring drive into London, probably a poor atmosphere, little drinking time before the game and a late finish in the small hours of Thursday morning. I came to the conclusion that the main reason, on a personal level, was for me to witness – let’s hope – the immediate and entertaining upturn in our play since the Stoke City defeat on Saturday. I simply hoped for goals, attacking football and a reaffirmation of our collective love of Jose Mourinho. A hope for better things. A just reward for my Wednesday evening sortie into town. It reminded of the days of following the club in the era, much doted upon by Chelsea supporters of a certain vintage, of “the drought” when we didn’t expect entertaining football at Stamford Bridge, or even a win, but we just attended games out of blind devotion and the hope, however small, that our patience would be rewarded with an entertainment-ridden goal fest. Due to patchy fog in Wiltshire and traffic congestion in London, the drive to Chelsea took three full hours. Parky and I jostled into the boozer just after 7pm. There was a quick “hello goodbye” and then I was off with Alan to The Bridge. There was time to mull over a few talking points. Within parts of the Chelsea fan base, there had been surprising reactions to the defeat at the Britannia Stadium. There was the call to move Petr Cech on and recall Thibaut Courtois. I found this to be rather harsh. At the Stoke game, he certainly erred for the first goal, but could hardly be held responsible for the others. There was also a desire among some fans for Mourinho to recall David Luiz; his errant behaviour, much-frowned-upon and castigated by many of those same fans, forgotten. There was even frustration with Mourinho himself. We all know that this team, this squad even, is changing. I’d rather have Jose in charge than anyone else. That is not to say we should bow down and follow blindly. There is always room for opinion and debate. Even I have tired of Mourinho’s snipes at our strike force’s lack of goals. However, as always, there is a thin line between quiet and constructive criticism as opposed to loud and knee-jerk negativism. Football fans are never happy. We were inside Stamford Bridge as early as 7.25pm and my immediate concern was the vast amount of blue seats clearly visible. By 7.45pm, my fears had subsided. It was yet another near full house for a Champions League night. Our support, often derided, should again be applauded. Steaua brought a full 3,000 in March; tonight it was around 2,000. As the teams entered the pitch, the away end was lit with the many lights from the travelling Romanians’ mobile phones. There were obviously Steaua fans in the East Upper too; lights there also. Mark Schwarzer was in goal, Ashley Cole was at left-back, David Luiz was partnering JT, Frank was paired with Mikel in the anchor roles, Willian and Oscar recalled alongside Hazard, Ba upfront. Chelsea began positively and a goal came under just ten minutes. Willian sent over a corner which was flicked on at the near post by Oscar and Demba Ba pounced. Good start. Nerves settled. Let’s go to town. Alas, the rest of the first-half offered little to cheer. In fact, Steaua could easily have levelled the score, only for Iancu to shoot wide. On several occasions, they worked the ball into our box but – thankfully – the ball tended to miraculously avoid an away player. Both Oscar and Hazard were quiet. Mikel had started poorly, managed to get himself booked, but then redeemed himself with a few cool pieces of play. At a Chelsea corner, I watched as an unmarked Lampard on the edge of the box signalled for the ball to be played out to him. The resultant volley was spectacular but was hit high of Tatarusanu’s bar. Lots of huff and puff in the first-half, not much quality. I noted that the scoreboard above the away fans was showing that Demba Ba had scored for Steaua and we were losing 1-0. I wondered if the work of Nicolae Ceausescu was still being done. At half-time, a lovely moment. Our much-loved former right-back / wing back / midfielder Dan Petrescu was given a lovely introduction by Neil Barnett. Dan was the first “foreigner” to play two hundred games for us. How we loved his shuffling style and his incisive passing. He was serenaded by Chelsea fans and Steaua fans alike. He played for Steaua in the 1989 European Cup Final versus the mighty Milan. I love it that he now manages Dynamo Moscow; a club forever linked with the history of Chelsea Football Club. At The Shed, he momentarily picked up a Steaua scarf and the away fans lapped it up. That was probably the highlight of the night. As the game restarted, a few fans in the Matthew Harding attempted to “get things going” and I, at least, joined in. But generally, it was quiet. There was not one single song from the 12,000 spectators in the West Stand. The Shed were quiet. It was one of those nights. I often wonder what a lost soul from the “drought years” would make of these European Nights at Stamford Bridge these days. What would an exiled Brit, maybe now living in Australia, returning to a revamped Bridge for the first time since 1990 make of it. There were few highlights in a very low key second period. Ba had a great chance soon into the second period but blasted high. Andre Schurrle, who had probably his best game in a CFC shirt in Bucharest, was introduced by Mourinho and soon enjoyed an impressive run at the heart of the Steaua defence. His direct play pleases me. On this occasion, he struck at goal and the rebound was headed over by Hazard. Ba was played in and volleyed home, but was ruled offside. Not to signify a Chelsea win, just for the game to end and for me to get home. This was clearly a mediocre Chelsea performance. I sensed a great feeling of numbed disappointment in the lack of attacking verve rather than euphoria about cementing pole position in our group. There was little there for me to admire. As I left the stadium, I walked around to touch the Peter Osgood statue; a bit of a superstition on Champions League Nights for me. A quick touch of his right boot. And thoughts of Athens, Istanbul, St. Petersburg, Milan and Leverkusen. 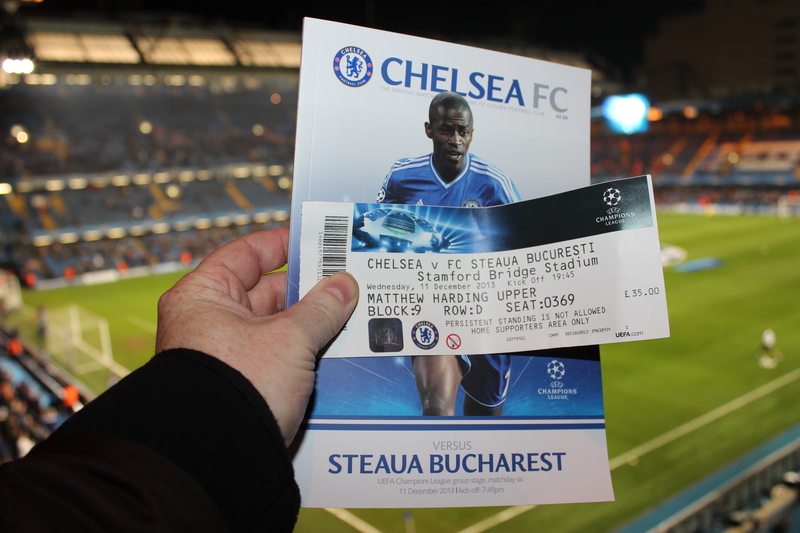 Chelsea vs. Steaua Bucharest : 14 March 2013. I wasn’t one of the 150 or so Chelsea who ventured out to the Romanian capital last week for the first leg of this Europa Cup tie. From what I have heard, it was one of the best European trips for a while. Because there were so few travelers, everyone kept together and a boozy time, aided by ridiculously cheap alcohol, resulted in a fine trip. The game, as is so often the case, was the least enjoyable part of the trip. In The Goose before the return leg, I briefly chatted to Mick, who had been one of the 150. The strangest thing during his short stay was being greeted by a family of locals who were sleeping in the lobby of the apartment he had rented for the three days. By the time he had awoken in the morning, they had disappeared. Mick shrugged it off. I wondered if this sort of thing was common…in Liverpool. Parky and I had reached The Goose in good time, but I soon realised how quiet the pub seemed to be. My good friend Orlin, the Bulgarian who now lives in San Francisco, was in town en route to Sofia and soon joined us. We had managed to wangle a spare ticket for a mate of his too, so everything was looking rosy. I noted that the Chelsea website mentioned that ticket sales for the game had been suspended, which obviously indicated that tickets had still been on sale. I was asked during the day what I thought the gate might be. I really had no clue, though the figure of 32,000 stuck in my head. Daryl mentioned that it was exactly one year to the day since that amazing 4-1 victory over Napoli. Our greatest ever journey started that night. In comparison, the game with Steaua seemed to be something of an afterthought. Personally speaking, a lot of my focus was still on the F.A. Cup tie with Manchester United. However, going into the game, I had no real fears about us exiting the competition to Steaua. They were for the taking, despite the woeful performance in Bucharest. Alan had sold my ticket for the game in Romania to one of around twenty Chelsea supporting Bulgarians from Varna. I mentioned this to Orlin, who was one of the leading lights in setting up the oft-seen Chelsea/Bulgaria Supporters Club. As I have mentioned before, Orlin’s club of birth is Levski Sofia; he still holds a season ticket at the stadium. The price? A whopping £35. Parky and I almost spat our drinks out when we heard that. Anyway, Orlin mentioned the various friendships that exist between clubs in Sofia and further beyond in the old communist bloc. For example, Levski’s main rival is CSKA Sofia, the old army team. It seems that supporters of the three “army” clubs of Bulgaria, Romania and the former Yugoslavia (CSKA Sofia, Steaua Bucharest and Dynamo Belgrade) often cross borders to attend each other’s games. Additionally, there are many Levski / Chelsea fans. Therefore, for the game in Bucharest, Orlin explained that many Levski fans travelled to Romania to support Chelsea and many CSKA fans travelled to support Steaua. With that, I looked up and spotted a “Bulgaria Spurs” banner at the San Siro. What does this all prove? Maybe that the standard of Bulgarian football is not so great and football fanatics will travel vast distances to get their fix. From Bulgaria to Tottenham, though? Oh boy. Of course, Chelsea has their own little band of allies in Rangers, Hearts, Linfield, Feyenoord and Lazio. We spoke briefly about the chances of meeting Spurs in the final in Amsterdam. Tottenham, of course, has a link with Ajax, the old Jewish club of Amsterdam, so the thought of a Chelsea versus Tottenham in Amsterdam, with a side portion of Ajax versus Feyenoord thrown in for good measure brought wry looks from the two of us. Orlin’s mate arrived just in time to see William Gallas put through his own net to tie things at the San Siro. The pub exploded with glee. To see that lot go out would set things up nicely before we set off for the match. We crossed our fingers as we set off for the stadium. It was another cold night in SW6. There were many Romanians outside Stamford Bridge, obviously without tickets. A chap was using a tannoy to dissuade away fans from entering the forecourt. There were more police than usual on show. Outside the turnstiles, all was quiet. Deathly quiet. There was no line, no queue. I wondered how low this attendance could possibly be. Please don’t embarrass me, Chelsea. Once inside, I glanced across at the East Stand and it was just over half-full. Thankfully, the other stands were in better shape. The three thousand Romanians in the opposite corner were in good voice already. As the teams entered the pitch, I spotted many away fans holding up their phones and there were many doing the same in the designated home areas. Our home areas had obviously been infiltrated by Steaua fans. We could be in for an interesting evening. Alongside me, Alan – like myself – was suffering with a cold and a chest infection. He excused himself from singing too much. 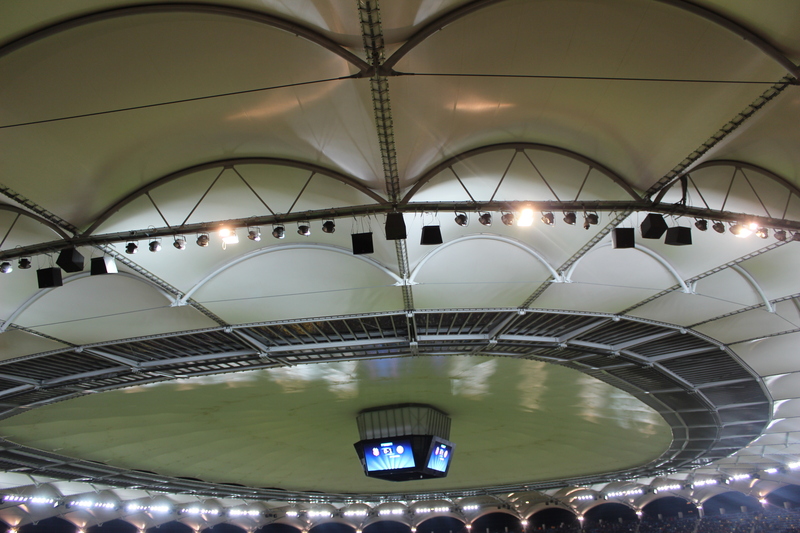 He had said that the noise created by the home fans in Bucharest was very impressive. I wasn’t so sure we’d be able to generate one tenth of that, to be honest. Soon into the game, I texted a few friends to say that I predicted a gate of 28,000. What did I know of Steaua? Very little. Our paths almost crossed in early 1988 when I sold some English football badges outside the San Siro when they played Milan in a friendly. Only 14,000 were at that Sunday game some 25 years ago, but I was not one of them. I chose to stay outside and attempt to sell some more badges to late-comers and early-leavers. I made £40 that afternoon; enough for a few more meals as I travelled by train between friends in Germany and Italy. Unbeknown to me at the time, the game foretold the 1989 European Cup Final when a Milan team including Ruud Gullit defeated a Steaua team including Dan Petrescu. There was, in fact, a nice interview with Dan Petrescu – what a lovely player he was – in the programme. The first real chance of the game took place when Mikel lost possession and a ball was pumped through for Rusescu. I thought that there was a hint of offside, but – not to worry – the shot was easily saved by Petr Cech. A couple more away efforts on Cech’s goal signalled that this would be no walk in the park. We were treated to two rare Jon Obi Mikel shots on goal midway through the first period, but the ‘keeper was untroubled. Then, thankfully a breakthrough. Ramires threaded in Mata, who danced a few more steps inside the box and nudged the ball goal wards. It almost apologetically limped over the line. Torres blasted wide, and then the lively Hazard shot at the ‘keeper. However, just on half-time, a Steaua corner was not cleared and Chiriches blasted high into the net from only a few yards out. A hundred or so Steaua fans in the West Lower danced with glee, but were oddly not escorted out. We now had to score two more goals to advance. I then just caught John Terry’s perfect leap to meet the ball and send it crashing down and into the Steaua goal. The crowd roared and the captain reeled away in delight. No time to waste. Let’s get another. Chelsea were now enjoying more and more of the ball as the opposition tired. Their fans, who had spent the first-half noisily whistling every time we were in possession, grew quieter. On several occasions, Eden Hazard was just a blur. One rapier-like sprint into the Steaua box was the most exciting piece of play of the entire match. When he is on fire, he is lovely to watch. However, a fine one-handed save from Petr Cech kept us in the game. On seventy minutes, Hazard played in Fernando Torres and the whole of the Matthew Harding held their breath. One touch, then a split second to steady himself. Torres thought of ice cubes, of a bitterly cold wind, of liquid nitrogen, of absolute zero. Rather than a heated, flustered finish, his body froze and he only thought of one thing. He coolly and calmly used his weaker left foot to score, slipping the ball past the ‘keeper at the far post. Again, the crowd erupted. I watched through my lens as he celebrated with team mates at the corner flag only a few yards away. Snap, snap, snap, snap, snap, snap, snap, snap. Only Petr Cech and John Terry did not clamber all over him. Was this the match winner? It looked like it. Just after, Szukala appeared to clip Torres as he raided the penalty box again. The referee’s assistant behind the goal line was incredibly well placed but – surprise! – elected not to give anything. I am yet to see these officials actively engage in any game I have attended. What a waste of time. Torres must have been clipped as he lay on his front for ages. He was taken off, re-appeared with a shirt which did not have a number, then had to go off to get that replaced. His bloodied nose was not obvious to me. With five minutes to go, a desperate lunge at the excellent Hazard and the referee rewarded Chelsea with a penalty. I watched as Torres took the ball and – with memories of Sunderland – we all hoped for a similar result. I chose to photograph the moment of impact. I looked up to see the ball smack against the bar. Torres in a nutshell…one step forward, two steps back. A couple more Chelsea chances came and went. The referee blew for the end of the game and we all heaved a sigh of relief. As I walked away, I saw the Steaua team in one extended huddle. They had acquitted themselves well over the two legs and really should have sewn it up in Bucharest. I made my way out into the cold of a London night. Outside the back of the Matthew Harding, a small group of Chelsea fans were singing about Rafa Benitez. I suddenly realised that it was the very first such song that I had heard the entire evening. Outside on the Fulham Road I spotted even more Romanians. It was clear that many had not made it inside. Before I knew it I was back inside in my car and headed home, sneezing away like a good’un, my cold now making life quite unpleasant. It was a long and weary drive back to Somerset.